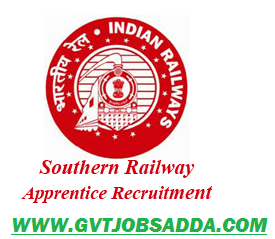 Southern Railway Recruitment 2019 Online applications are invited from the eligible candidates to “Workshop Personnel Officer, S&T Workshop, Southern Railway, Podanur-641 023” for engagement as Trade/Act Apprentices under Apprentice Act 1961 for the year 2018-19 in various units of Southern Railway in the stream of Freshers and Ex.Those candidates who are interested & eligible for Southern Railway Recruitment 2019 Apply online before last date. Brief information has been Given below. Processing fee (Non-Refundable) Rs.100/-: Fee is to be paid through ONLINE MODE. No fee is required to be paid by SC/ST/PH/Women candidates. Must have passed 10th class examination under 10 +2 system or its equivalent with minimum 50% marks in aggregate. Must have passed +2 with Science (Physics, Chemistry & Biology) for MLT Candidates.